As far as Hawaiian instrumentals go, Olinda Road by HAPA is surely one that deserves an ‘ukulele tab arrangement. Olinda Road was possibly the first song Hawaiian song I ever heard. It was on the first CD I owned – Putamayo Presents: Islands. That last track by somebody named HAPA was pure magic. I’d spin it over and over in my little purple boombox, amazed at how somebody could make sounds so lovely. The love affair continued many years later after moving to Hawai’i with my family and hearing more of HAPA’s music on KAPA radio in Kona. 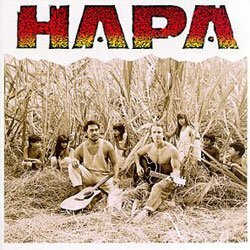 Their first album, HAPA, came home one day and remains one of my family’s favorite Hawaiian records. I finally put two and two together and realized that HAPA’s Barry Flanagan had written one of the tunes on my old Islands album. 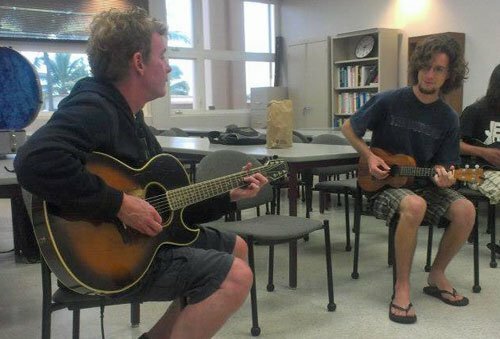 I ended up at the two-year Institute of Hawaiian Music program on the island of Maui in 2012. With lots of free time outside of class for practicing, writing, and figuring out songs, I came up with an ‘ukulele arrangement of Olinda Road. We began performing it at gigs and it became one of my signature show tunes during my time in the Institute. The icing on the cake was when our program director facilitated bringing Barry Flanagan to class one day and I got to play Olinda Road with its creator. I was over the moon. 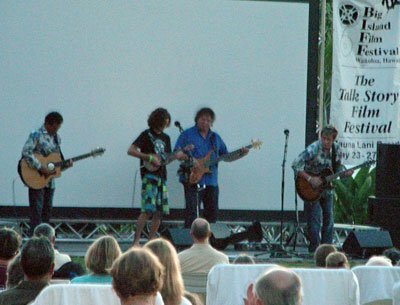 After I had graduated and returned home to the Big Island, I went to a HAPA concert at one of the hotels. Before the show I found Barry backstage and said hi. He was thrilled and invited me to play with the band when they got to Olinda Road at the end of the show. So I performed Olinda Road with HAPA onstage at the Big Island Film Fest while playing Ron Kuala’au’s ‘ukulele in my board shorts, t-shirt, and green festival wristband. It was like flying. Needless to say, I’m rather fond of this song. But enough of my self-indulgent stories! For this arrangement, you’ll need a low G, no questions asked. Many guitar pieces transposed for ‘ukulele work best with a low-g and this one is no different. You’ll find many bass notes in this tune that bounce off that string. One of Barry’s signature sounds is his use of palm muting to make the attack short and “plucky.” So you’ll find places in the tune where it says “P.M.” with a bracket bar around the notes that should be palm muted. To do that, just rest the side of your picking hand on top of the saddle and curl your fingers to pick. There is more on palm muting in this lesson. With this song, you’ll have to be critical of the fingers you use to fret certain parts on your uke. It’s easy to get tangled up in the main theme by trying to use the wrong digits. That said, the A part can be played with your first three fingers, if you wish. A pinky here and there might make stretches easier depending on your flexibility. Some tips on fretting fingers. One thing to point out are occasional fermatas. There are several places in the song where there is an odd-time pause. When I asked Barry about this he said it wasn’t intentional and called it a moment of “ADD guitar playing.” So instead of trying to notate it exactly (which broke my tab program when I first attempted it), I just put in a fermata that means to hold the note (or rest) for as long as feels right. Maybe this is a cop out, but I never play it with the odd pause and it’s up to you whether you want to add it in. The ding, ding harmonics that separate verse repeats are tricky to say the least. (When Barry overdubs something, you know it’s hard.) It took me a long time to get them consistent and I still mess them up occasionally. Pick closer to the bridge to make them pop out and instead of chiming exactly over the 7th fret, move your finger a little sharp (like 1/5th of a fret worth). This is the true center of the harmonic which brings it into focus better. Here’s a lesson on how to play harmonics. I notated the fast brush strum at the end of the bridge as tremolo picking. But in truth I think it’s a much more gentle brush strum. So don’t try and aggressively tremolo pick those chords. Just practice the chords with a normal strum first and then speed it up until the sounds wash together and it sounds appropriate. You’ll want to back off your strumming pressure on the strings as you go faster to maintain a steady and pleasant volume level. Without further ado, here’s Olinda Road for ‘ukulele!